Start Your Senses Spots & Stripes Safari Gym is rated 4.6 out of 5 by 7. Designed using sensory stimulating principles, the Bright Starts™ Spots & Stripes Safari™ Gym is packed with activities and features. The giraffe prop pillow supports baby during tummy-time and the large play mat features high-contrast colors, exciting patterns, and fun characters. 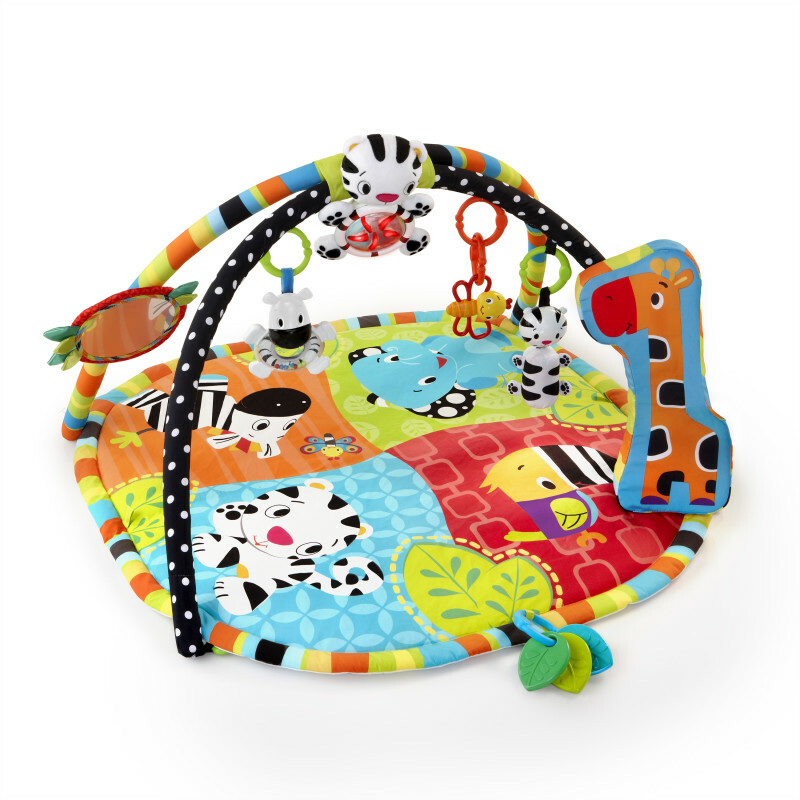 The toy set includes a tiger toy with 20+ minutes of lights and melodies, zebra rattle, tiger chime, baby-safe mirror, bug link, and leaf-shaped toys. Dimension (in) 32" x 32" x 18"
Mat is machine washableToys: Wipe clean with damp cloth and mild soap. Do not immerse in water. Rated 5 out of 5 by firsttimemommy from Love it My son loves this and will lay under it for an hour at a time. There is so much for him to do and he loves the lights and music. I love watching him laugh and smile when he's under it. Rated 4 out of 5 by ylime2 from Bright and Fun! Great placement of the toys as my daughter is still unable to sit up to play. They were perfectly placed where her arms could reach. The bright colors kept her attention. Plenty of room on the mat for her to roll around and still be engaged. The girafe "pillow" isn't very soft and we weren't really sure what to do with it. Seems to just be something to look at. Music isn't continuous so if you select the motion sensored setting, it doesn't always trigger each time you make a movement. Would have given 5 stars if not for these two things. Overall, it's a great playmat and our daughter seems to enjoy! Rated 5 out of 5 by Lilly from Best Play Mat!! My son loves this play mat! The cat toy that lights up and plays music will have him cooing and smiling for hours it seems. He's only 2 months and really enjoys this mat. Possible the best baby gift I have recieved! Rated 5 out of 5 by LightSlider from Kid Loves It - Great Support My little boy loves this mat, especially the black & white kitty with lights that plays music. I was disappointed when my kitty stopped working after 4 months, but the company provided great customer service and shipped us a new kitty! Rated 4 out of 5 by Katiejoy21 from Great Overall this has been a great life saver! My daughter loves the light up teddy bear. My only complaint is that same teddy bear has stopped working. But otherwise it has been a great product. Rated 4 out of 5 by TJStork from awesome overall I got this awesome play yard two months ago and my four month old loves to watch the colorful lights go around and bat at the toys! My two year old loves to join him too. My only concern is that the batteries keep popping and the acid worries me. Rated 5 out of 5 by Allison from This has saved my life From the time my son was one month old, we have used this mat and he has LOVED it. It made tummy time more bearable and has helped him develop his grabbing, reaching and rolling. I'm buying one of these for everyone I know who is expecting!